So I was feeling pretty down on myself last week after I drove out to Ellicott City to drop off a CV and application. On the way back I drove by a farm that had a curiously pasty, white castle entrance set a ways back from the road. Further inspection revealed what I had suspected all along: this is the famous Clark's Elioak Farm that is salvaging and painstakingly restoring the ancient relics of the Enchanted Forest. Almost any born and bred Baltimorean 30 years old and above will remember The Enchanted Forest, that kitschy local amusement park that fell on hard times around the late 80's and finally closed down for good, after some transformations, in 1997. Many of the attractions that people remember, however, were left neglected from 1990 on, and have been sitting, decaying, ever since. It always got me down that the Enchanted Forest only rented out for birthday parties from April to October - because my birthday is in March. This is the closest I have ever gotten to that fabled "Happy Birthday" Cake. Jack and Jill go tumbling down the hill, humiliated as ever. As a child, I would've mentioned that Jill's bloomers were showin'. The crooked house, crooked cat and crooked man. I don't recall whose house this was. Must be their next big repair project. Anyone remember this boat? The big face with no eyes always freaked me out, but not enough that I showed it. Only enough to silently disturb me. The whale was fun though. One of my favorite parts of Enchanted Forest was that whole area outside of the main "fairy tale" section, with the mammoth white mountain slide, the "fishin' hole" and the safari ride. I especially loved the slide - it was THE best thing about an amusement park filled with great stuff. For a kid of 10, that is. I have no idea what to say here. This is probably another restoration section. Wasn't that sombrero painted in fancier colors than, er, off-white? My day at Clark's was the first time I ever realized that the Old Woman had a hippie son sitting on top of her shoe house. This had to have been part of a ride of some sort, but I don't recall if was just to truck people around the amusement park or what. "Could you get out of my room, please?" Props from Cinderella's Castle, sitting in the pumpkin coach that trucked people to the castle. Of course, you could always walk to the castle, but who wanted to do that? One of the Three Little Pigs. Most retellings always make the piggies male. I had never remembered that the Enchanted Forest made little girl pigs. Here's straw house pig getting blown over. And here's Gladys, the most successful pig builder, coming out of her well-constructed chimney. And we finish with a displaced stepsister from Cinderella 's Castle. The dress has actually held up well. So has her hair. She's standing on top of an old but well-preserved carriage that was not part of the Enchanted Forest. I also got to see the animals on the farm - horses, cows, sheep, chickens, roosters (several of whom roamed freely), an emu (!) and goats. One kid got her head caught in the fencing and it took two of the farm employees to get her out. She wasn't old enough to figure out that she needed to turn her head sideways. A few of us patrons stood there and tried to calm her down (she was not enjoying this). As soon as she was freed she got the hell away from that fence. In all, I had much more fun than that goat. The Enchanted Forest was a nice distraction from the problems I have been having lately, as was the Good Humor ice cream sandwich I bought afterwards in the store for $1.50. That was one big ice cream sandwich. I'll need to go back again soon! Oh my gosh, thank you so much for posting these! I know I visited the park as a child in the early to mid 70's but I have no recollection of this save from old family photos. But of course, I'd seen the facade countless times. I had no idea this restoration was going on or that these were viewable by the public. I'll definitely be taking my kids for a visit! I LOOOOOOOOVED the enchanted forest... this was our fave field trip local growing up!!! I loved going there so much when I was little! I pass this farm every day on my way to work, and have yet to visit. I think it's great that they've committed to restoring everything in the old Enchanted Forest. The tea cup in question comes from the Alice in Wonderland ride, I believe. Remember the iron turnstiles at the end of some of the rides? The slide you mentioned was on Mt. Vesuvius, an "island" in the middle of the lake. You had to take a boat to get there, but when you finished the slide you walked through a tunnel, then a turnstile which led you out into the park. k8: I didn't realize that it was the fist children's amusement park in America. Anon: I LOVED that mountain but I never remembered what it was called. I think I always called it "Magic Mountain" or something like that. The mountain was my favorite part of Enchanted Forest. But I always thought it was a much longer and extensive slide. I know it was near the safari ride and the fishin' hole. What a great trip down "memory lane". The rehab they're doing looks incredible. But, I gotta tell you, I remember going to Enchanted Forest as a very young kid and being scared out of my mind by some of the stuff! But it must not have left too many permanent scars because I remember the park fondly and was devastated (maybe that's a bit strong) when I heard they were closing it. I'm so glad someone is preserving this piece of Baltimore history. Hi, My name is Monica, and I am a member of EFPS - (Enchanted Forest Preservation Society). We are a group of regular folks who love the E.F. and wanted to see it saved. We try to keep people updated on the latest going on with The E. F. and Clark's Elioak Farm on EFPS. One of our members found your post, and sent me the link. THANK YOU for posting about The E.F.!! - It truly is an, (dare I say), "Enchanted" place, and it has been so wonderful to see some of the pieces being saved and moved from their original location, to Clark's Elioak Farm! One of the figures you pointed out in your pics -(the hippie on the toe of The Old Woman's Shoe), is of Mark Cline, of "Enchanted Castle Studios", who also went to The E.F. as a child and now makes these types of figures for a livng. He has also done work for Six Flags, and we have been thrilled to have him recreating some of the lost E.F. figures. 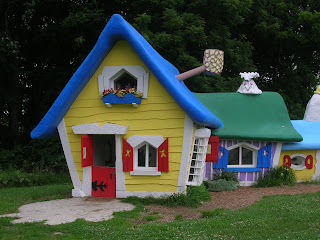 That particular figure he did of himself, so that, in his words, he "could always be a part of The E.F."
The little house that is under construction, that you also had a pic of is part of The Rock-a-Bye Tree, which was the home of the three fairies that raised Sleeping Beauty. You used to be able to walk inside of the tree and sit in little chairs at a little table - perfect for having a cup of tea at. The Tree is one of the projects that will soon be restored. Thank you again for your post and pics! - If it is ok with you, I'd love to post a link to your post at the EFPS website! Ps. _ sorry to take up so much room - hope that you and your readers can use the info. Thanks for your link, and glad you liked the post. Of COURSE, feel free to link to it. As for that last photo: I remember now. That was Peter's wife after all! And thanks for reminding me about the Sleeping Beauty faeries' house and chairs.